What we see in this stunning high resolution photo of the Hubble Space Telescope is the M51 galaxy, also known as the Whirlpool galaxy for its very long arms. It is located at a distance of about 23 million light years from Earth, but it is really bright: one of the brightest after M31. The apparent magnitude is 8.4: so it is theoretically visible even with 10 × 50 binoculars if the evening is optimal and the city lights absent. To watch it you have to turn your instruments towards the big wagon, under Alkaid, the last star of the bow. (13h 29m 52.7s | + 47 ° 11 ’43 “). Since you are looking in that direction, we suggest this study on the open mass of the big wagon. Well, what are we seeing in this beautiful picture? The first thing that catches one’s eye is that we are talking about a spiral galaxy, and that we are really lucky as we see it perpendicularly oriented to our line of sight. It is precisely this absolute perspective that allows us to capture really interesting and unique details. One of these details is its extremely long and curved arms. 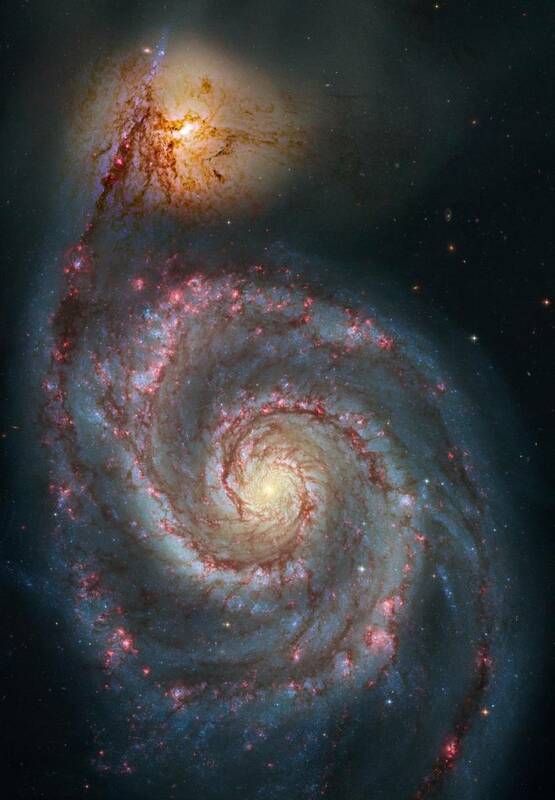 Many spiral galaxies possess numerous arms with less pronounced forms, while those of M51 are well pronounced. And it is precisely here where the magic of the birth of the stars takes place. Another unmissable detail that is captured in this photo is that the arms shine with a soft light and blue. This is an unequivocal sign of the presence of millions of very young stars. A reconfirmation of this is that we see that in the midst of the blue light shine innumerable zones of pink light: They are diffuse nebulae that are generating stars and that are illuminated by the neighboring stars and by the proto-stars they are generating. To make a comparison within our galaxy, we must think of these forges of stars as the beautiful Orion Nebula (M42), or the Eagle Nebula (M16). Sporadically here and there, still inside the arms, you can also notice small open clusters: regions of stars very close and born from the same nebula. At the top of the photo we see another galaxy: NGC 5195. It is an elliptical galaxy which is much older than M51 and less active. And this is shown by the fact that we do not see any trace of young blue stars or widespread nebulae. In this galaxy we only see a large area of yellow light coming from middle-aged stars. Astronomers believe that NGC 5195 is responsible for the well prounounced arms of M51. High-resolution Hubble photos have highlighted that NGC 5195, although very close, is actually behind M51 and, therefore, we are witnessing a game of cosmic perspectives. It is certain, however, that While NGC 5195 moves under M51, its gravitational influence compresses the gas clouds on the latter’s arms, triggering the processes of star formation. Let us identify the last details of this extraordinary image: compare it with the image below and in correspondence with the colored dots you should find planetary nebulae. 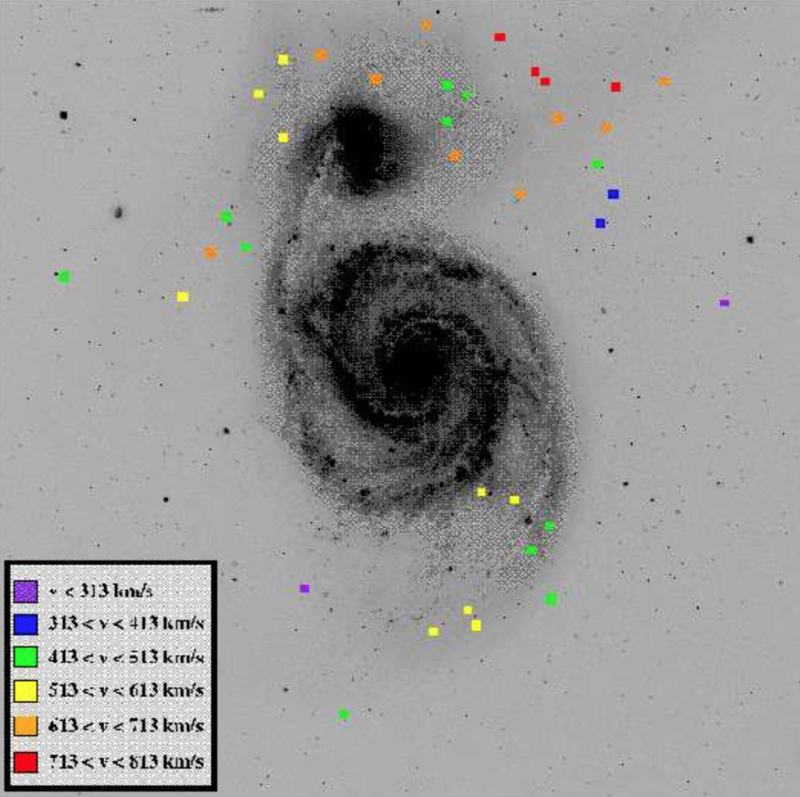 This map was developed by a team of researchers who have launched a research program on extra-galactic planetary nebulae using M51 among the subjects due to its distance and favourable perspective. So, next time you look towards the big chariot remember that there, in the middle of a handful of stars, hides one of the most beautiful galaxies in the sky.